Q&A: How Many Stars Are There in The Universe? Are we alone in the universe? The hunt for extraterrestrial life is a complex search leading in many directions. What is most certain among researchers involved in this hunt, however, is the dependence of life on organic elements. Life as we know it evolved from organic compounds, molecules composed of primarily carbon and hydrogen—and where there are organics, there is a possibility of life. The process by which planets acquire organics has been studied for centuries, the most prominent theory being that planets are exposed to organics through impacts from exterior bodies like comets and asteroids. Now, a recent discovery on the dwarf planet Ceres shows that planets don’t always acquire organics from exterior impacts, but instead can form these materials in their interiors. Photo of Ceres’ surface. Each crater is the result of an impact by an exterior body. Approximately 4.6 billion years ago, our solar system was formed. During the period of planet formation, small bodies (such as comets and asteroids) were ubiquitous and bombarded newly-forming planets. Frequent collisions allowed for molecules such as water and organic compounds to make their way to different planets, acting as passengers on these smaller bodies. This is how many believe Earth acquired its organic materials some four and a half billion years ago. As the Earth continued to mature, it cooled down, developed an atmosphere, and began harboring the evolution of life. This same process of smaller bodies colliding with other planets is very common throughout the universe, far beyond our solar system. Now, researchers are able to analyze craters left behind from these impacts by examining their radioactive decay. This method of analysis determines a crater’s age and composition, painting a history of the planet. And, as observed on the dwarf planet Ceres, this analysis can lead to major conclusions about the origins of different elements on these planets. 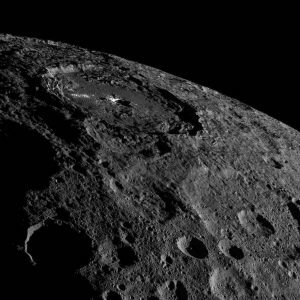 In early February 2017, the Dawn Spacecraft, first launched by NASA in 2007, gathered data about Ceres from its spectrometer that shows organic-rich areas on the surface of the dwarf planet. The spectrometer measures different wavelengths of light (such as visible and infrared), which are plotted to reveal important information about the object emitting or reflecting that light. When plotted, the infrared spectra show absorption bands, which are wavelengths of light that are absorbed only if certain organic compounds are present on areas of Ceres’ surface. The highest concentrations of these organics occur in a heavily-cratered and fresh region, partly on the southwest floor of the Ernutet crater. The photograph above is a map of absorption bands of a region near the Ernutet crater where the highest concentration of organics were found. Warmer colors indicate higher concentrations. Researchers are ruling out the possibility of an external origin for these organics because they lie in a heavily-impacted region. For organics to survive they need to be in a stable environment, so the presence of high concentrations in a freshly-cratered region means another source must be supplying the organic materials. “We think the organics in the subsurface were concentrated somehow, perhaps by hydrothermal activity, and then exhumed by impacts,” said Harry McSween, a University of Tennessee geophysicist involved in the study. This idea that Ceres’ core is hydrothermally active suggests that Ceres may have been able to independently form organics in its interior, while impacts from asteroids or comets exposed these organics to the surface. Although scientists have now found strong evidence to support the idea that planets can form their own organic elements, there are several obstacles to overcome before applying this to the search for extraterrestrial life. Kanani Lee, a mineral physicist at Yale University, explains that four conditions are necessary for life to form: the proper elements, a burst of energy, shelter, and an environment conducive to formation of life. “Even though we know Ceres has the right elements, it is too small to produce a significant magnetic field capable of protecting it from radiation, and it doesn’t have a safe environment for life to evolve because it is frequently impacted by smaller bodies,” Lee said. Despite Ceres’ failure as a legitimate contender for harboring life, this discovery broadens how we think about extraterrestrial life. “Ceres already contained processed organic matter, so the ingredients for life were there in molecular form—life did not have to start from scratch with elements,” McSween said. With further research on dwarf planets in our solar system and on exoplanets, researchers will begin to learn more about the patterns of interiorly-formed organics and the planets that harbor them, narrowing the search for life elsewhere in the universe.